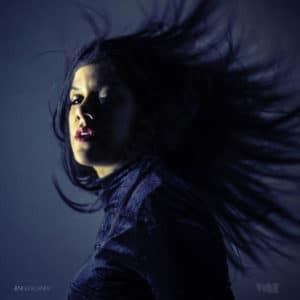 Those lines from the third cut on Jen Gloeckner’s ninth album Vibe Street isn’t what the doctor ordered. Which is to say she COULD NOT HAVE DREAMT THIS (even if she could pick up the tab for dinner.) Produced here by James Blake (fresh out a second stint in rehab), the pair collaborate on a whimsical ode to Gloeckner’s third release, Vine, a much-loved slice o’ wax that dropped way back in 2017, nearly eight years after her previous effort, the long-forgotten Mouth of Mars. The above excerpt is taken from the March 11, 2033 issue of Pitchfork Weekly Magazine (yep, they go back to print after the final destruction of the World Internet in 2029). And while the reviewer (C. Chad Billings) misses the mark in his assessment of the lyrics from Jen’s spooky “Palatial Charade (Down by the Spillway)”, there can be no mistaking the fact that with Vine, Gloeckner begins to hit hard, right in the head, with a few sideswipes at the heart. After spinning the vinyl well over 12 times, this slippery slider has yet to really sink into my cerebellum. And that’s a good thing, very good. Spiced with electrics, oozed over with spectral harmony flybys and anchored (as much as can be) by Jen’s haunting lyrical specks. It’s electrical folk swirl soul, if we must provide a label. For a release on the aptly named Spinning Head records, why not forget about where Vine fits in to any sort of grander scheme (musically or otherwise) and just float into the clattery, windswept beach of “Blowing Through” or dip a toe into “Row With the Flow,” with its lovely smears of Twin Peaks guitar. That’s all Jen’s really asking for with Vine, anyway, to settle you back and unsettle your bearings, then work to ease you back to them, like Beth Orton at the end of October (that year it came early and surprised us all). Jen’s work here feels like the perfect defense against the dying of the light, a subtle kick to the head of daylight savings time and all it will bring with it. Get ready, people, winter lurks just over that dying cornfield.